For the first time, scientists have observed ripples in the fabric of spacetime called gravitational waves, arriving at the earth from a cataclysmic event in the distant universe. This confirms a major prediction of Albert Einstein’s 1915 general theory of relativity, and opens an unprecedented new window onto the cosmos. The gravitational waves were detected on September 14, 2015, at 5:51 a.m. Eastern Daylight Time (9:51 a.m. UTC) by both of the twin Laser Interferometer Gravitational-wave Observatory (LIGO) detectors, located in Livingston, Louisiana, and Hanford, Washington, USA. The LIGO Observatories are funded by the National Science Foundation (NSF), and were conceived, built, and are operated by Caltech and MIT. The discovery, accepted for publication in the journal Physical Review Letters, was made by the LIGO Scientific Collaboration (which includes the GEO Collaboration and the Australian Consortium for Interferometric Gravitational Astronomy) and the Virgo Collaboration using data from the two LIGO detectors. A team of physicists from Syracuse University’s College of Arts and Sciences has been instrumental in the discovery. They include Peter Saulson, the Martin A. Pomerantz ’37 Professor of Physics; Duncan Brown, the Charles Brightman Endowed Professor of Physics; Stefan Ballmer, assistant professor of physics; and a group of nearly two dozen students and research scientists. The discovery was made possible by the enhanced capabilities of Advanced LIGO, a major upgrade that increases the sensitivity of the instruments compared to the first generation LIGO detectors, enabling a large increase in the volume of the universe probed—and the discovery of gravitational waves during its first observation run. 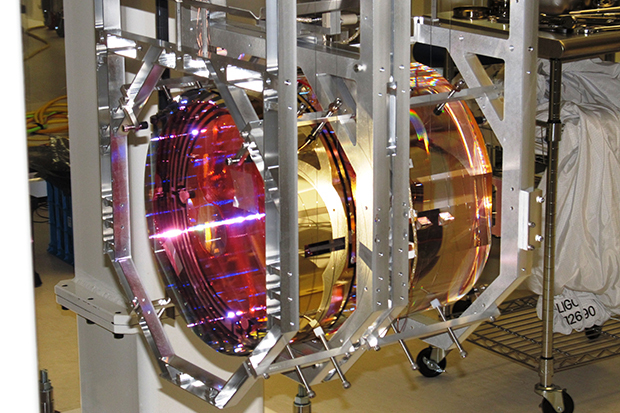 The US National Science Foundation leads in financial support for Advanced LIGO. Funding organizations in Germany (Max Planck Society), the U.K. (Science and Technology Facilities Council, STFC), and Australia (Australian Research Council) also have made significant commitments to the project. Several of the key technologies that made Advanced LIGO so much more sensitive have been developed and tested by the German-UK-GEO collaboration. Significant computer resources have been contributed by the AEI Hannover Atlas Cluster, the LIGO Laboratory, Syracuse University and the University of Wisconsin-Milwaukee. 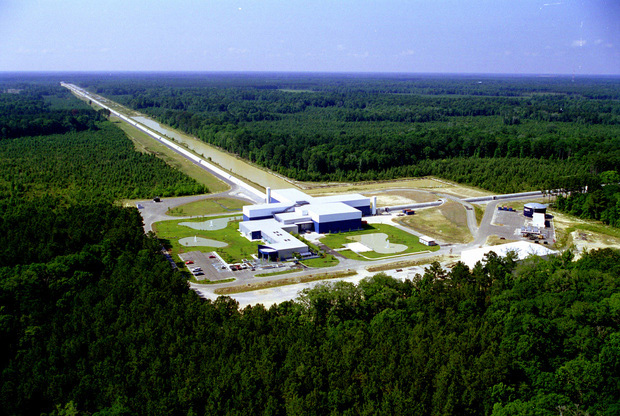 Several universities designed, built and tested key components for Advanced LIGO: The Australian National University, the University of Adelaide, the University of Florida, Stanford University, Columbia University of New York and Louisiana State University. 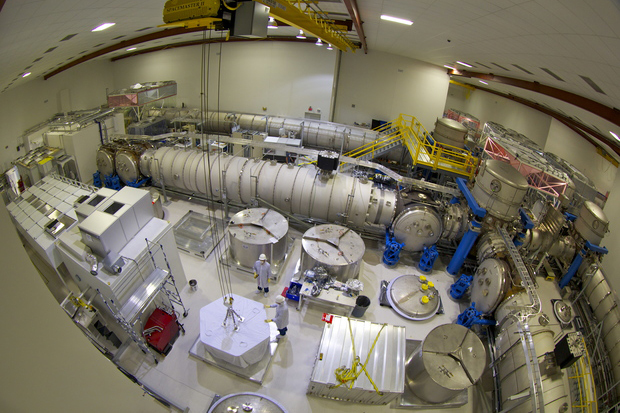 Each of the two LIGO detectors is a giant laser interferometer. A laser beam is split into two, and then is sent down a pair of 2.5 mile-long tunnels that are perpendicular to one another. Mirrors at the end of the tunnels reflect the light back to where the laser beam was split. Since both tunnels are the same length, the light takes exactly the same time to travel to the end of each tunnel and back. But if a gravitational wave passes through Earth, it changes the length of the tunnels, causing the light beams to return at different times. By comparing both beams, LIGO is able to measure the stretching of spacetime caused by gravitational waves. Brown says that LIGO detectors are so sensitive that even the slightest trace of background noise—the hum of an air compressor, the rumbling of traffic, the crashing of an ocean wave, hundreds of miles away—can drown out gravitational-wave signals. Therefore, LIGO scientists need massive amounts of computing power to find signals in the noise. Brown and his LIGO collaborators use a high throughput computing environment called Orange Grid, along with the Crush supercomputer, housed in the Green Data Center on the University’s South Campus, to detect black holes. LIGO was originally proposed as a means of detecting these gravitational waves in the 1980s by Rainer Weiss, professor of physics emeritus from MIT; Kip Thorne, Caltech’s Richard P. Feynman Professor of Theoretical Physics, emeritus; and Ronald Drever, professor of physics emeritus also from Caltech. The current generation of Syracuse physicists continues the tradition of leadership in gravity research dating back to Peter Bergmann, one of Einstein’s research assistants and a professor in Syracuse’s physics department from 1947 to 1982. Other University notables include Emeritus Professor Joshua Goldberg, former research scientist Roy Kerr and LIGO spokesperson Gabriela Gonzàlez G’95. In addition to carrying out one of the first calculations of the emission of gravitational waves by binary stars, Goldberg organized a 1957 landmark conference, in which the physical effects of gravitational waves were predicted and the first experiments to detect these waves were conceived. Kerr, who was on the research staff from 1958 to 1960, discovered the solution to the Einstein field equation of general relativity, which describes the black holes that LIGO saw. González is professor of physics and astronomy at LSU, as well as one of Saulson’s former Ph.D. students. LIGO research is carried out by the LIGO Scientific Collaboration (LSC), a group of more than a thousand scientists from universities around the United States and in 14 other countries. More than 90 universities and research institutes in the LSC develop detector technology and analyze data; approximately 250 students are strong contributing members of the collaboration. The LSC detector network includes the LIGO interferometers and the GEO600 detector. The GEO team includes scientists at the Max Planck Institute for Gravitational Physics (Albert Einstein Institute, AEI), Leibniz Universität Hannover, along with partners at the University of Glasgow, Cardiff University, the University of Birmingham, other universities in the United Kingdom and the University of the Balearic Islands in Spain. Virgo research is carried out by the Virgo Collaboration, consisting of more than 250 physicists and engineers belonging to 19 different European research groups: six from the Centre National de la Recherche Scientifique (CNRS) in France; eight from the Istituto Nazionale di Fisica Nucleare (INFN) in Italy; two in The Netherlands with Nikhef; the Wigner RCP in Hungary; the POLGRAW group in Poland; and the European Gravitational Observatory (EGO), the laboratory hosting the Virgo detector near Pisa in Italy. Searching For Gravitational Waves News Conference at Syracuse University from Syracuse University News on Vimeo.